Falling populations of penguins in the West Antarctic Peninsula are being driven by a reduction of their main food source, Antarctic krill, according to a new study. As a result, species such as the chinstrap penguin are much more vulnerable to a warming climate than previously thought, say U.S. scientists from the National Oceanic and Atmospheric Administration. "Long thought to be ecological winners in the climate-warming scenario, the chinstrap penguin instead may be among the most vulnerable species affected by a warming climate," wrote the authors of a study appearing this week in the Proceedings of the National Academy of Science. Populations of Chinstrap penguins are falling and the loss of sea ice can't be responsible, as the penguins forage in ice-free water in winter. ((iStock))The scientists have been monitoring colonies of chinstrap penguins (Pygoscelis Antarctica) and the Adélie penguin (Pygoscelis adeliae) in the West Antarctic Peninsula and Scotia Sea for thirty years. Over this time they noted that populations of both species declined by more than 50 per cent, with fewer juveniles surviving and returning to breed. In the past, the decline has been attributed to reductions of winter sea ice in the West Antarctic Peninsula, one of the fastest warming areas on the planet, having a direct impact on the penguin's habitat. While this theory would explain the decline of Adélie penguins that forage from ice packs in winter, it doesn't explain why populations of chinstrap penguins, which forage in ice-free water in winter, are also falling. Instead, the scientists suggest that changes in penguin populations are linked with changes to their main food source, Antarctic krill (Euphasia superba) due to reduced winter sea ice coverage and an increase in interspecies competition. Penguins developed an appetite for krill as their food of choice when other krill-eating predators such as whales and fur seals were heavily hunted. During this time penguin populations flourished. But as the populations of whales and fur seals have recovered over the last three decades, the numbers of penguins have dropped as they compete for krill. At the same time, the West Antarctic Peninsula has seen a rapid decline in winter sea ice, necessary for krill to thrive. "Krill density [in this region] has declined by about 80 per cent from the mid 1970s and this decline is associated with reductions in sea ice," the researchers wrote. "The decline in the reproductive capacity of the krill population, associated with the overall decline in sea ice, suggests that food resources for penguins and other predators may continue to decline in the near future." The scientists said this will have a critical impact on chinstrap penguins, which breed almost exclusively in the West Antarctic Peninsula and Scotia Sea. 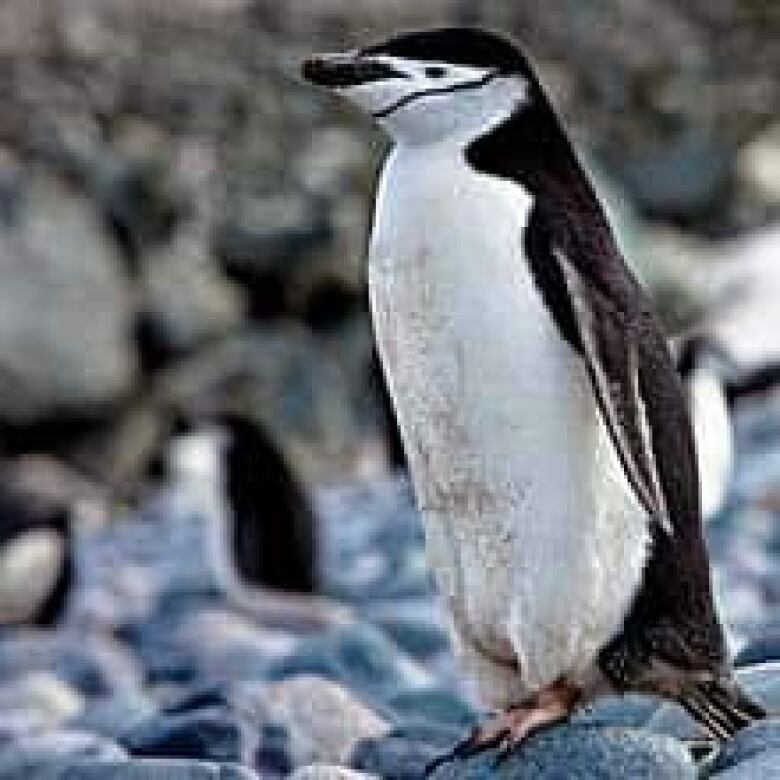 "Unlike Adélie penguins, which may be buffered by large, stable populations in the Ross Sea and Indian Ocean sector of Antarctica, chinstrap penguins have no southern breeding refuges," they wrote. Louise Emmerson from the Australian Antarctic Division, has been studying Adélie penguin populations in East Antarctica, which she says are currently increasing. But she says this latest research clearly shows populations on the West Antarctic Peninsula are experiencing dramatic declines. "What is very clear is that there have been increases of air temperature and decreases in sea ice and changes in some penguin populations [in the West Antarctic Peninsula]. If those changes in sea ice result in changes in krill availability, then that will have ramifications," said Emmerson. "Whether we see a shift towards other species or whether we see a decline across the board is something that will only become apparent in time." While Adélie and chinstrap populations are declining in the West Antarctic Peninsula, Emmerson says that populations of gentoo penguins, fur seals and whale populations are increasing in the same area. "So there's obviously food out there for some species," she said. "Whether we're having a shift in the relative population abundances for different species or whether there's an overall decline in the krill remains to be seen. "You would expect that if sea ice had an overall negative impact on krill, and the total amount of krill dropped very dramatically then it would affect the entire ecosystem. "At the moment it doesn't seem like all populations are crashing, but it could just be the start of it."